Katherine Arthur and her family are back, and it’s time to collect the money Mrs. Mellet left them in her will. The tidy sum will allow the family peace of mind and a future that’s stable and fulfilling. But when things don’t go exactly as planned, Katherine steps up to do more than her share. Hired as a kitchen mistress, her intuition (with the help of a mysterious recipe book), cooking prowess, and work ethic make her the perfect partner for the enigmatic, wealthy woman next door. Then Aleksey Zurchenko arrives. 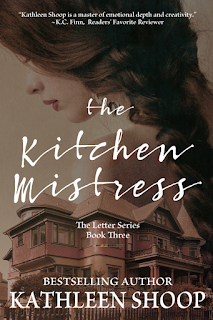 Katherine’s loyalties to her mother and Violet grow strained, and soon her commitment to both frays even further as her feelings for Aleksey grow. Katherine must decide if pursuing her work with the formidable Violet and protecting her family are more important than following love. Can she do it all? Love, hope, joy, secrets buried in walls and hearts; all are threatened by those who claim to care about the Arthurs. Can Katherine separate what’s right and true from what it takes to survive? Are they even different things? 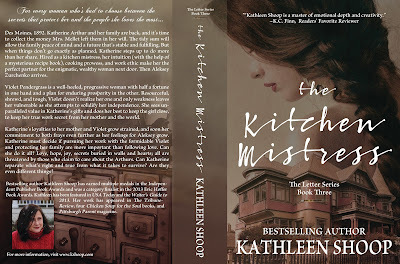 The Kitchen Mistress is available now in ebook and print editions on Amazon, Barnes & Noble, and Smashwords. Add them to your shelves on Goodreads, and check out Kathie's website for the scoop on all of her books and her blog posts about writing and historical research. i just visit this site, you have shared wonderful fiction book covers , these are dicerning independent authors very nicely, you have done amazing job, thank for sharing, keep it up. wow! what a lovely fiction book covers, i love these all , it beautifully presenting discerning of independent author, gonna write it in a Viralvog, you have done incredible work, thanks for sharing with this, keep it up. wow you have shared lavish fiction book covers for discerning independent authors, i would love to add it in Colonhub, you have done incredible work, thanks for sharing with us.